Nicotine salt e-liquids & pod systems have become extremely popular recently & with good reason! Nicotine salt liquids are specially formulated to deliver high nicotine levels without the harshness associated with traditional nicotine liquids & pod systems offer outstanding performance, portability, are extremely discreet & the easiest devices to use that have ever been made. First we'd like to point out that nicotine salt liquids are for use in low wattage, 20 watts or less devices and are not for use with subohm coils. This is because nicotine salt liquids are made with a high nicotine content, usually 25mg-50mg/ml and are designed specifically to provide a high dosage of nicotine with a smaller amount of vapor, the formulation of nicotine salts also allow for more rapid absorption to the bloodstream. 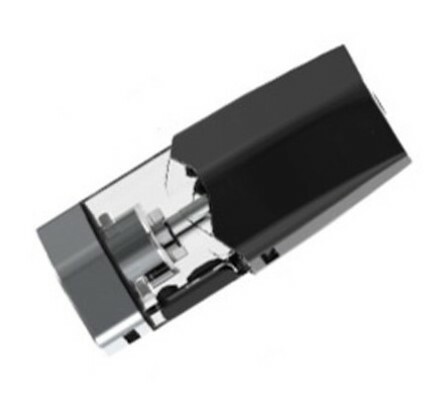 This makes them ideal for pod devices & also eGo/EVOD battery & clearomizer applications. However if you use them at high wattage and/or subohm resistance they will provide a lot of nicotine too fast and that would not be good! IMPORTANT: Pod systems work great with traditional (freebase) nicotine liquids OR nicotine salt liquids but nicotine salts should only be used in pod systems or other low power devices! The term nicotine "salt" refers to the molecular make up the nicotine itself, it has nothing to do with table salt & nic salt liquids do not have a salty taste. Chemically a "salt" is the byproduct of an acid reacting with a base and nicotine salt is extracted by mixing pure nicotine with certain acids. These acids are not in anyway harmful or corrosive and the resulting nicotine salts exist naturally in tobacco. Traditional nicotine, also referred to as freebase nicotine is extracted directly from tobacco. During this process all impurities found in the tobacco are removed which leaves nicotine in its pure form. This is the type of nicotine that was used almost exclusively in e-liquid production until a couple of years ago. Freebase nicotine has a high alkaline content with a PH level of about 7 to 8. This is important because the alkalinity of the nicotine directly affects the taste of the liquid & vapor it produces. The higher the alkalinity the harsher the vapor is & of course this increases as the nicotine content of the e-liquid increases. Transforming the nicotine from a freebase to salt form substantially reduces the alkalinity of the liquid which means it can be used at a much higher level in e-liquid without causing the irritation & harshness of traditional tobacco's. This is why salt based e-liquids are typically in the 25-50 mg/ml strength range. Because E-Liquids using nicotine salt can be formulated at higher nicotine levels and still deliver smooth, accurate flavor & the fact that nicotine salts are absorbed more rapidly in to the blood stream (at a rate close to an actual cigarette) they are ideal for use in situations where a high dose of nicotine is desired without using a big, bulky device and the resulting large clouds & high liquid consumption. Nicotine salts are also the easiest & most effective way for a smoker to transition to vaping. High strength nicotine salt e-liquids are not intended for use in high power applications and doing so can expose the user to dangerously high levels of nicotine. So if you are a cloud chaser nic salts are NOT for you. Nicotine salt e-liquids are also more expensive than freebase liquids. This is primarily because the extraction process involved is more expensive & also because there is much more nicotine in a 50mg strength bottle of nic salt liquid than there is in the same size bottle of 6 or 12mg freebase nic liquid. However the higher price is mitigated by the fact that nic salts are used in low power, low vapor devices & with the higher nicotine levels they are used less often. So, you will use much less liquid on a daily basis with nic salt liquids. Are nic salt liquids right for you? It really depends on what you vape for & what kind of device you like to use. If you like a large device and/or want to vape very rapidly then no, we would not recommend them. If you like the idea of a small discreet device that can deliver a good shot of nicotine quickly then we would definitely say yes. There is only one way to find out though, get a good pod device & try out some nic salt! Pod systems are extremely compact, lightweight and by far the easiest devices to use that have ever come on the market. Although they are small in size they are capable of providing a surprising level of performance, they do not nor are they intended to make the gigantic clouds of a 200 watt subohm tank rig but they will keep the average vaper satisfied & very happy. Pod systems work very well with both traditional freebase nicotine & nicotine salt e-liquids and if you are using nic salts they are the obvious choice due to the high level of nicotine contained in nic salt liquids. Pod systems get their name from the combined tank/coil unit which is called a pod. The pods are easily refillable with liquid and when the coil is worn out you either replace the entire pod or in some models remove the coil from the pod and then replace it with a new one, in these models you can also replace the tank separately when necessary. Below are illustrations of the components of the SMOK Nord kit which features a coil that separates from the pod & the SMOK Infinix pod where the coil is integral to the pod and the tank & coil are replaced as a unit. We think that the performance, convenience, ease of use, portability and light weight of pod systems put them far & above any other devices that have ever come on the market. If you remember, or still use a 510 set up the SMOK Infinix will absolutely blow you away. If you are using a eGo/EVOD setup you'll throw it away as soon as you get your hands on the SMOK Nord. In our opinion these devices are simply the best that have been invented in the ten years that E-Cigs have been around. Also as compared to a mod/tank system you will get much better "mileage" out of your e-liquid with a pod system which operate at lower power & do not have as much coil surface area. If you typically use 10-15ml per day using a mod/tank you will probably use about 5-8ml with a pod system. If you are into a huge volume of vapor then you will not like a pod system. Although they do make a lot of vapor for their size they quite simply are not cloud chucking rigs. That's really about it for disadvantages, we guess they are easier to lose and you won't build up you biceps doing curls to your mouth with them! We haven't picked up a tank rig since we received our first SMOK Nord about two months ago. We absolutely love the compact performance of this kit. We've been in this business since 2009 & the NORD is by far the best overall device we have ever seen. The Infinix is awesome as well and is about the size of a stick of gum & weighs less than and ounce! We generally run 12mg standard freebase liquids through them as it provides ample nicotine for us, however they work incredibly well with the nicotine salt liquids and if you like a lot of nicotine you will not be disappointed with the combination. We are just beginning to test the wide array of pod kits that have come on the market. So far the SMOK kits have far and away been the best performers, we will continue to research & test additional models and as always bring them to you if we feel that they offer good performance and value.